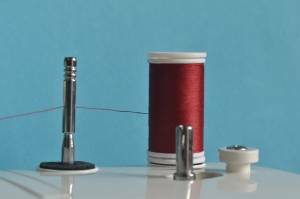 How Do You Know If You’re Using The Right Thread? Here’s an article excerpt from “Basic Clothing Construction” that takes the mystery out of choosing the right sewing thread for your sewing project! There are many types of threads – carpet thread, darning thread, embroidery thread, crochet thread, basting thread, and buttonhole twist as examples. This article will deal only with the threads that are primarily used with most projects done on a sewing machine. stretch fabrics of any fiber. Most polyester threads have a wax or silicone finish to help them slip through the fabric with a minimum of friction. About the author: Sarah J. Doyle is author of over 25 sewing, craft and how-to books, as well as author of online pattern making, sewing and craft classes. Visit LearnHowtoSew.com and ClothingContruction.com for more tips and how-to information. Copyright 2004-2014, Sarah J. Doyle. All Rights Reserved.